Looking for a healthy lunch idea? 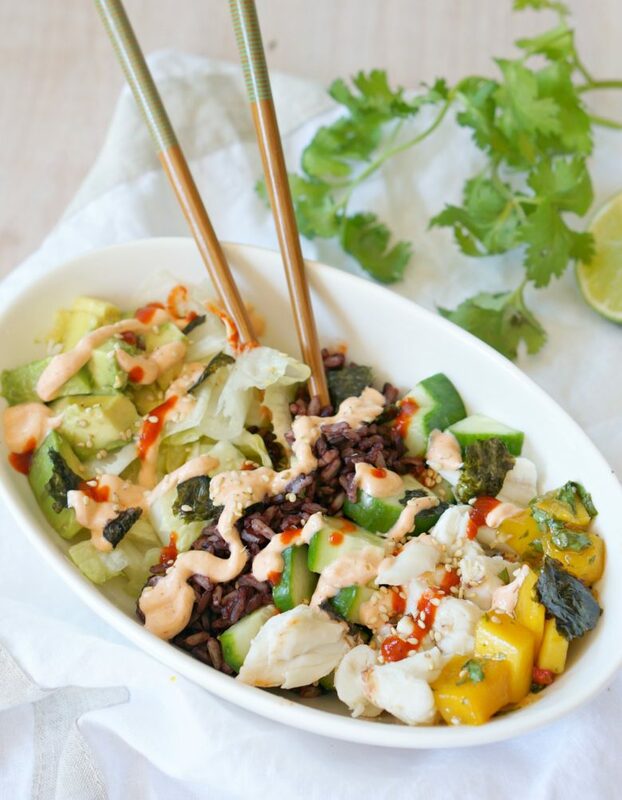 Turn your favorite sushi roll into a healthy salad and grain bowl with this Spicy California Roll Sushi Bowl recipe. I’ve been working on bunches and bunches of seafood recipes for a client of mine. One of the fortunate side effects, is that I’ve found myself, on occasion, with extra seafood that I get to experiment with on my own. Such was the case the other day with some beautiful lump crab. After whipping up the most decadent Crab and Seafoood Gnocchi Mac ‘n Cheese for my client, I wanted to make something light for myself for lunch. 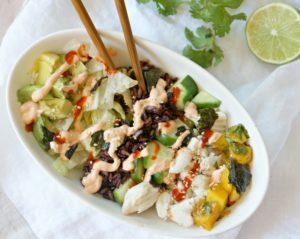 Which is how I stumbled upon the idea to take my favorite ingredients from a California Roll and turn it into a Spicy California Roll Sushi Bowl. But with real lump crab instead of the fake stuff and a healthier spicy sauce. 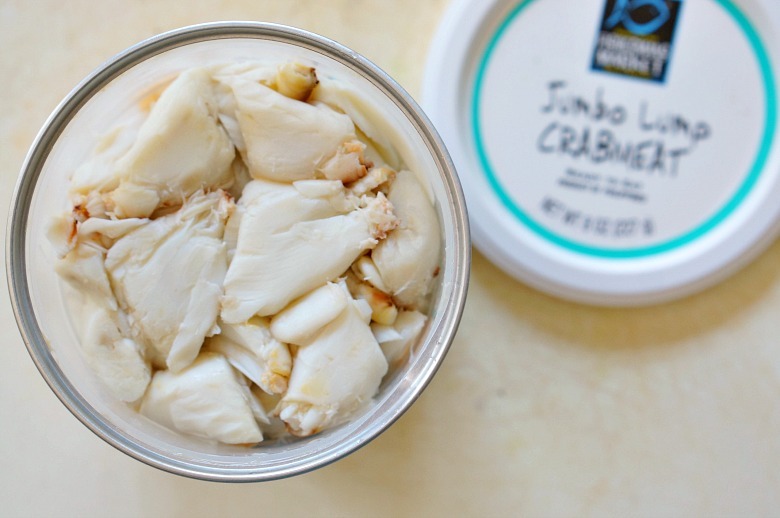 It was so delicious that I may actually buy lump crab just to treat myself again! First, make the mango topping. 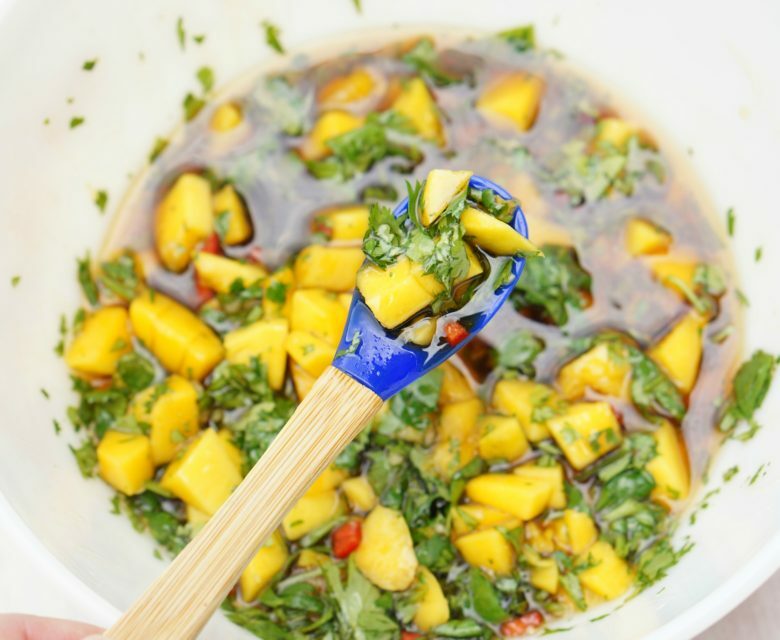 Combine one chopped mango with the cilantro, chili pepper, soy sauce and sesame oil. Stir and refrigerate until ready to use. In a second bowl, combine the Greek yogurt with several tablespoons (to taste) of Sriracha. Prep the remaining ingredients and let’s get ready to assemble these sushi bowls! The base of my salad is fresh chopped Romaine and Forbidden rice. If you’ve made extra from this recipe, it would be perfect in this sushi bowl! 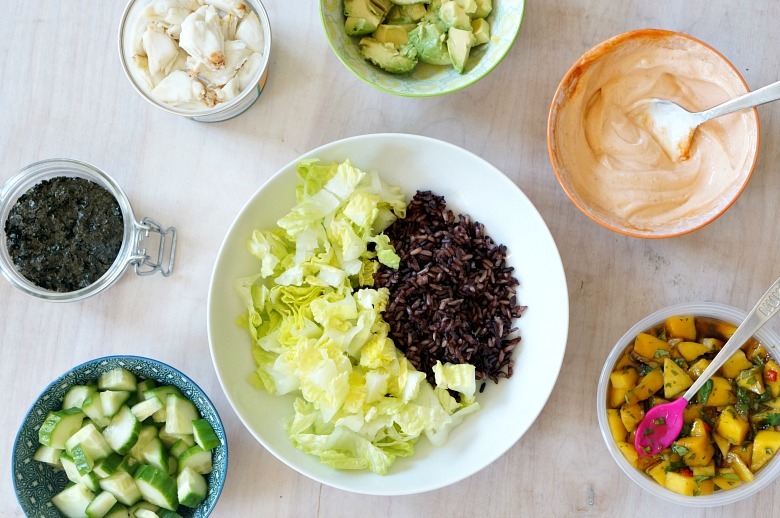 To the lettuce and rice, add the crab, chopped avocado, cucumber and mango. Top with the Sriracha yogurt mixture, additional drizzles of Sriracha and sesame seeds. Enjoy! Prep the remaining ingredients and let's get ready to assemble these sushi bowls! The base of my salad is fresh chopped Romaine and Forbidden rice. 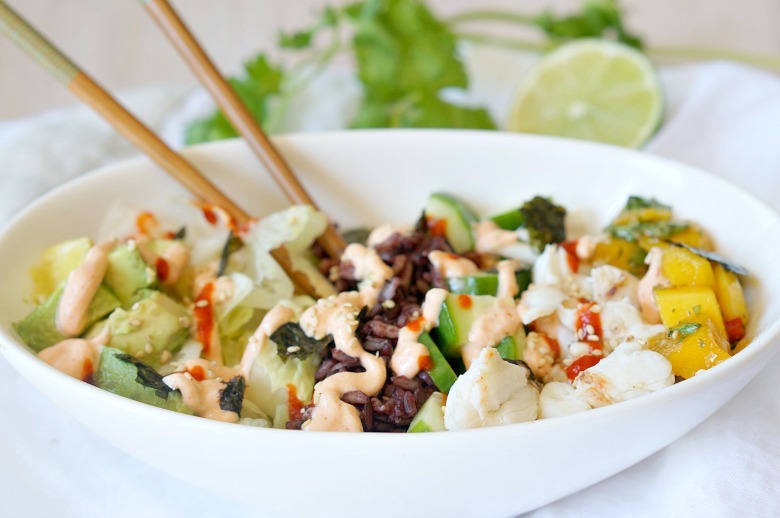 If you've made extra from this recipe, it would be perfect in this sushi bowl! 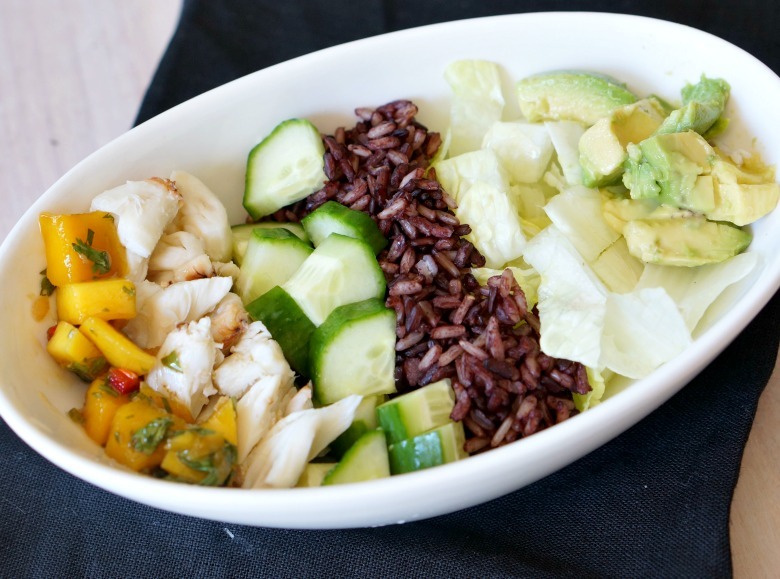 To the lettuce and rice, add the crab, chopped avocado, cucumber and mango. Top with the Sriracha yogurt mixture, additional drizzles of Sriracha and sesame seeds.